On July 30th of this year the Atlanta Falcons will say a farewell to their home since 1992, the Georgia Dome. A $1.5 billion project is underway just one mile north of the dome, the Mercedes Benz Stadium. I have to say, this will be an incredible way to tie the bow on a great season for the Falcons!! This new state-of-the-art stadium will feature a pinwheel shaped, retractable roof, comprised of eight triangular panels that, when opened, creates the illusion of birds’ wings, a symbolic honor to our winning team! The technology and precision that have gone in to making this dream a reality blows my mind. When you consider the measurements, angles, weights etc. that have to be calculated so precisely, you have to know there are a host of brainy mathematicians running around the site holding some pretty savvy tools and technology in their hands. Undoubtedly, these tools are used and referenced as truth over and over again throughout the project. They are dependable, absolute, the belief system, if you will. Without these tools the integrity of the finished work of this massive structure would be in question. As parents, we are building a life from the ground up. Our belief system is the tool we hold in our hands to reference for every decision we make in the process. So many of us stumble into this thing we call “parenting” with a belief system that finds it’s origin in what? Our own pain? The way our parents parented? The latest parenting trends? Break room chats? However we are feeling in the moment? Google? So here’s my challenge to you: Know your belief system and where it comes from. Take a look around you at the adults in your life. All of them are the finished work of their parents (or caregivers) whether they chose the guidance of their parents or not. Have you ever wondered if, for example, the receptionist at the office is the kind of person her parents had in mind when they were training her up from infancy to adulthood? You may think of her or someone else in your life and say “Yes! She must have had really awesome parents!” or you may be thinking just the opposite, “Boy, she’s a piece of work!”. All of us are products of our upbringing. Even if we were rebels, we are like living, breathing, talking structures fashioned by the hands of our parents, our environment, and our experiences. These three powerful influences begin communicating to us at a very young age a belief system that our young minds readily absorb. Soon we begin using this belief system, solid or flawed as it may be, to make choices and form opinions which also contribute to the finished product we call “adult”. Our parents, of course, have a great deal of control over our environment and experiences growing up, so it goes without saying, as parents, our belief system is critical to the finished work of parenting. By the time we get to be adults and start having children, we think we have it all figured out with our neatly packaged belief system we’ve acquired from growing up and because these opinions, ideas, and beliefs are ours, to us they are the gospel truth. We hold on to them as if they were written in stone thousands of years ago. It might behoove us to stop and consider the possibility that one or two (or many) of our opinions/beliefs may be way off. Maybe we should do a little reality check and ask ourselves, “Where did this belief/opinion/method I have come from?” and then take a painful journey through our past and trace it all the way to its inception. What people, environment and experiences do I find when I finally reach the end of that journey? Really? So this is my point of reference for truth? Now imagine where this journey would end for all people across the globe. The possibilities are endless! And somehow, all of it is truth according to relativism. “Hugh! Take a mental journey that could be painful and force me to evaluate what I really believe? No thanks! I would rather keep reaching for my “belief system shelf” that I’ve piled high with all the stuff from people and experiences from my past.” he says while he drowns out his sorrows with another shot of Jack Daniels, or she says while she goes on a shopping binge to forget the disappointment of a troubled marriage. We are lazy and don’t want to think that hard and don’t have the time or emotional energy it requires, yet what we believe is the driving force behind everything we do, every choice we make. “Does it really matter? I mean, my belief system has worked well for me so far.” we may say. Has it? Are we sure about that? Remember, our children are students of our life. We sure better hope it works because they are picking it up as their gospel to live by, and we shouldn’t be surprised if their version of it looks different than ours since it’s only founded on our own personal opinions anyway ,and herein lies the problem with relativism, the view that truth is based on the opinions and ideas of each individual person. Relativism is constantly evolving. It is like shifting sand on the seashore. If this is our belief system, as soon as our opinions and beliefs are passed on to our children they will morph into something slightly or very different depending on what our kids decide to do with it. Relativism or Absolute Truth. We are either one or the other. There is no middle ground. And our children will pick up very quickly where we stand. If we say we believe in absolute truth, what is it’s source and are we living a life that is aligned with it? If we are consistently living in such a way that doesn’t measure up to what we say we believe we are sending out a resounding message that truth is up for each one to interpret for himself. In this environment, how can we expect our children to adhere to boundaries and rules we establish in our homes?Once this message has been repeated over and over by the way we live and train our children, they will finally get it and begin composing their own belief system only to have it morph into something completely different in the next generation. How pathetically unstable is this belief system we call relativism! No matter how you slice it, we will parent out of our belief system. 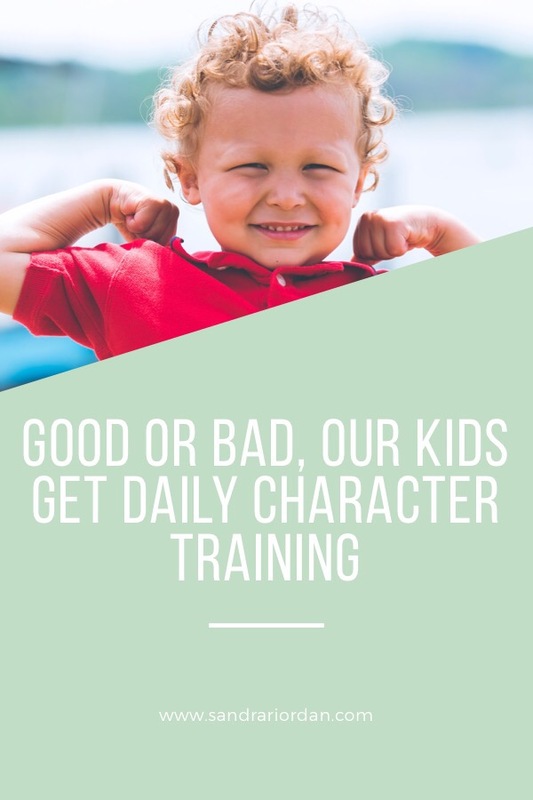 Wouldn’t you agree that it is pretty important that we make certain the “measurements, angels and weights” of training up our children are calculated with a tool that is absolute? So, what about absolute truth? Does it exist? If it doesn’t exist how can we classify anything as evil? For evil to exist implies there is a standard. Do you want to train up your children in an environment where truth is based not on personal opinions or beliefs but on something that never changes, that’s rock solid, that stands the test of time, location and experience, that will still be standing when everything else falls? If so, I challenge you to search it out. And don’t stop searching until you know, that you know, that you know you’ve found it. It’s worth the journey.